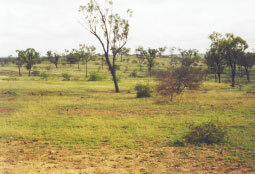 Land condition determines the capacity of grazing land to produce useful forage. how well rainfall is being used to grow grass. Land condition is therefore directly related to carrying capacity, livestock production and profitability of a grazing enterprise. Soil condition determines the capacity of the soil to absorb and store rainfall, to store and cycle nutrients, to provide habitat for seed germination and plant growth, and to resist erosion. Pasture condition determines the capacity of the pasture to capture sunlight and convert its energy into palatable green leaf, to use rainfall efficiently, to conserve soil condition and to cycle nutrients. The number and size of trees also influences the capacity of the woodland to grow pasture, to cycle nutrients, and to regulate ground-water. High presence of organic matter and good soil structure are key indicators of soil condition. Compare the soil surface condition around a grass tussock to that in a bare or scalded area. Erosion is another key indicator of soil condition. Signs vary with the form of erosion. Inter-rill or sheet erosion is the loss of thin layers or sheets of soil in each successive storm and can eventually lead to the loss of all top-soil. As water concentrates into discrete flow paths, it forms rill erosion, seen as tiny gullies. As these rills widen and deepen, they form gully erosion. Scalding is the result of massive loss of top-soil in texture-contrast or duplex soils. The sub-soil, when exposed, is typically hard when dry and has very low infiltration rates. The density and coverage of 3P grasses (perennial, productive, palatable) is a key indicator of pasture condition. 3P grasses capture sunlight efficiently and help keep moisture and nutrients in the paddock. They maintain soil organic matter, thereby stimulating soil organisms and promoting soil structure. 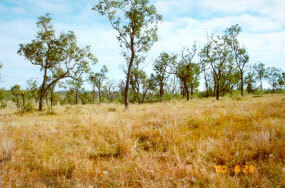 Decline in 3P grasses reduces land condition. Maintaining ground cover above 50% is essential for minimising runoff and loss of nutrients and soil. Low ground cover results in less sunlight being used by plants and poor water use. Weeds compete with the desirable pasture plants for light, nutrients and water. Some weeds also hinder stock movement and others may be toxic to cattle. Weed infestations are often associated with declining land condition, as weeds are able to exploit disturbed and bare areas, taking advantage of reduced competition from pasture. Less than 25% of long-term carrying capacity. Often no long-term ability to carry stock. On any land type, each of the condition categories may be represented by more than one form or ‘state’. 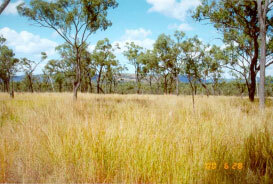 For example, condition A land may be represented by different mixes of 3P grasses (including exotics). Similarly, condition D land may be represented by lack of 3P grasses, or by extensive loss of soil condition. The four broad condition categories provide a means of ranking these ‘states’ with respect to their ability to grow useful forage. Land condition can change due to natural events (e.g. 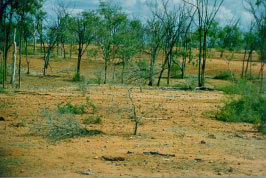 drought) or due to grazing land management practices (e.g. stocking rates, fire, weeds) of the landholder. Degradation of grazing lands is the loss of land condition. In the early stages of degradation, the condition of the land is responsive to a change in management. Degradation is judged to be severe if it is irreversible over a reasonable time scale and/or is expensive to rehabilitate. The rolling ball model demonstrates these principles. Woody plants can stimulate the ecosystem by acting as nutrient pumps and reducing water loss via evaporation. However woody plants can also use resources that could otherwise be directed towards forage production. Some grazing lands have a trend of increasing woodiness and, as the density of woody plants increases, the competitive effects on pasture growth usually cancel out the stimulatory effects. Increased woodiness therefore reduces carrying capacity. So, as well as considering land condition when calculating long-term carrying capacity, it is also necessary to consider woodland thickening. As tree size and density increases, annual pasture growth (kg/ha) also declines and the paddock subsequently has a reduced capacity to carry stock. Tree basal area (TBA) is a measure used for calculating tree density. It is an estimate of the tree or shrub trunk size per hectare of area.